The Miami real estate market is unstoppable. And bigger and more expensive is the trend. New buildings are going up in every corner. Since 2011, 71 buildings, with 19,834 units, have been proposed, planned or completed. And that’s just residential construction, according to Condo Vultures, which tracks South Florida building activity. 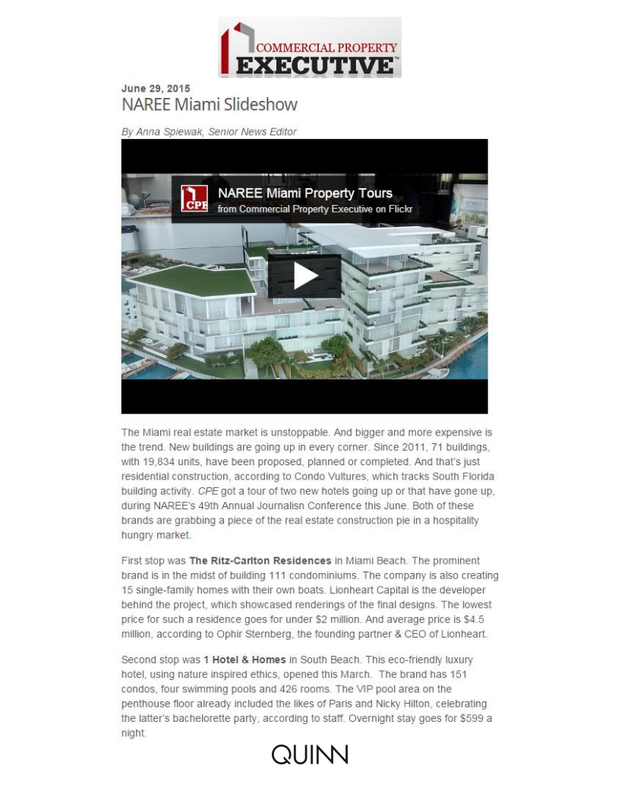 CPE got a tour of two new hotels going up or that have gone up, during NAREE’s 49th Annual Journalisn Conference this June. Both of these brands are grabbing a piece of the real estate construction pie in a hospitality hungry market. First stop was The Ritz-Carlton Residences in Miami Beach. The prominent brand is in the midst of building 111 condominiums. The company is also creating 15 single-family homes with their own boats. Lionheart Capital is the developer behind the project, which showcased renderings of the final designs. The lowest price for such a residence goes for under $2 million. And average price is $4.5 million, according to Ophir Sternberg, the founding partner & CEO of Lionheart. Second stop was 1 Hotel & Homes in South Beach. This eco-friendly luxury hotel, using nature inspired ethics, opened this March. The brand has 151 condos, four swimming pools and 426 rooms. The VIP pool area on the penthouse floor already included the likes of Paris and Nicky Hilton, celebrating the latter’s bachelorette party, according to staff. Overnight stay goes for $599 a night.